1971 - race | Yamaha Motor Co., Ltd.
View an archive of races Yamaha competed in 1971. P. Read, rode his TD-2 to claim his fourth championship title in this class. The number of races in the 1971 series was increased to 12, with a new event in Australia as well as a round in Sweden for the first time after a 10-year hiatus. Yamaha won nine races to take the manufacturer's title. Phil Read, rode his Yamaha to claim his fourth championship title in this class. Rodney Gould, the previous year's champion, finished second in the rankings. The championship finished with eight out of the top ten riders on Yamaha's. Although the MZ took the win in the opening round, Read, who was out to reclaim his championship title, soon took the lead in the ranking by winning the next three races in West Germany, the Isle of Man and the Netherlands. In the Isle of Man, Yamaha dominated all three classes. In the 350cc class, Giacomo Agostini on the 3-cylinder MV factory machine retired in the first half of the race, allowing local rider Tony Jefferies to win the race on a Yamaha TR2. Headed by Read, Yamaha riders also dominated the top positions of the 250cc class. In the 125cc class, Chas Mortimer on a Yamaha machine based on the AX model kept the pursuing Maico at bay to win the race. Despite satisfactory early season results, Read made an unforced error which took him out of the fifth round in Belgium, thus giving the win to MZ's Silvio Grassetti. In the 6th round in East Germany, German rider Dieter Braun, who had previously won the 125cc class title on a Suzuki, rode a Yamaha alongside the other top Yamaha riders, Read and Gould. Braun won the race-long battle between the trio in the final moments to take his first win of the season. In Czechoslovakia, where the second half of the season began, Read missed the race due to an injury incurred during qualifying. 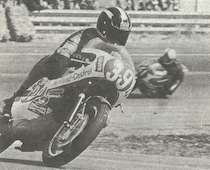 Janos Drapal, a dealer entry riding a TD-2, eventually won the race. He became the first Hungarian ever to win a Grand Prix. The eighth round in Sweden was held at a new venue in Anderstorp. Yamaha's Gould took his first win of the season there on the new circuit. The following round in Finland saw Read returning to the series after a 2-round absence, but he only managed 10th place, while Gould took the win. This win clinched the fifth manufacturer's title for Yamaha in the 250cc class, but the battle between Read and Gould for the rider's championship would continue in the final three races. This title battle came down to the 12th and final round in Spain. Gould's machine was not performing up to par during the early stages of the race, which allowed Read to take over the lead. But it was Jarno Saarinen who came out on top in the final part of the race and kept to lead the finishing line. This was his first win in the 250cc class. Read avoided pressing too hard to catch Saarinen, choosing instead a comfortable second place that clinched him his fifth championship title (one in the 125cc class, and four in the 250cc class). Saarinen also rode to two wins on the Yamaha TR2 production racer in the 350cc class this year to finish second in the ranking behind the champion, Agostini. This made him one of the favorites to win the championship in the near future.